Duke University has about 13,000 undergraduate and graduate students, a world-class faculty, and a strong commitment to applying knowledge in service to society. 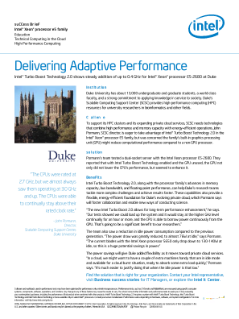 Duke’s Scalable Computing Support Center (SCSC) provides high-performance computing (HPC) resources ...for university researchers in bioinformatics and other fields. To support its HPC clusters and its expanding private cloud services, SCSC needs technologies that combine high performance and memory capacity with energy-efficient operations. John Pormann, SCSC director, is eager to take advantage of Intel® Turbo Boost Technology 2.0 in the Intel® Xeon® processor E5 family, but was concerned the family’s built-in graphics processing unit (GPU) might reduce computational performance compared to a non-GPU processor. Pormann’s team tested a dual-socket server with the Intel Xeon processor E5-2680. They reported that with Intel Turbo Boost Technology enabled and the GPU unused, the GPU not only did not lower the CPU’s performance, but seemed to enhance it. Intel Turbo Boost Technology 2.0, along with the processor family’s advances in memory capacity, bus bandwidth, and floating-point performance, can help Duke’s research teams tackle more complex challenges and achieve results faster. These capabilities also provide a flexible, energy-efficient foundation for Duke’s evolving private cloud, which Pormann says will foster collaboration and enable new ways of conducting science.